With more travelers migrating online to make room reservations, Archipelago Hotels now invite guests to facilitate a faster online booking process without the need for credit card information. Indonesia, May 2016 – In 2015, around 55.4 million people in Indonesia were using smartphones and 7.4 million were digital buyers – a direct result of increased mobility and today's impulse to turn to the internet for information. This phenomena has also impacted the hospitality industry, where most Indonesians look for and book accommodation via online mediums. This current trend has encouraged Indonesia’s largest hotel management chain, Archipelago International, to improve its online booking policies and systems. With a new system in place that allows travelers to book faster online without the need for credit card information, guests looking to stay at an Archipelago International hotel no longer need to worry about browsing through different websites or wasting time when booking accommodation. Booking a room directly via the Archipelago International brand websites can now take less than a minute and doesn’t require extensive searching nor does it require confidential details to secure a booking. Reservations can now be guaranteed without a credit card when reserving directly on Archipelago International's brand websites listed below or via their Archipelago membership app (link below to download). Guests simply pick their dates and room type, input their name and contact info and instant confirmation is given. Payment is done later upon checking in to the hotel. There are no additional credit card fees, booking fees or hidden charges – what guests see is what guests pay. Guests are guaranteed to receive Archipelago International Best Rates, available at more than 112 hotels in Indonesia, Malaysia and the Philippines. "Our vision has been to be the preferred hotel management company in Asia to our guests, employees and owners. This goal runs through all that we do, including making the easiest booking process for our guests.” says Tenaiya Brookfield, VP Sales & Marketing. Guests may visit favehotels.com, NeoHotels.com, QuestHotels.com, HarperHotels.com, Aston-International.com, AlanaHotels.com, and KamuelaVillas.com. 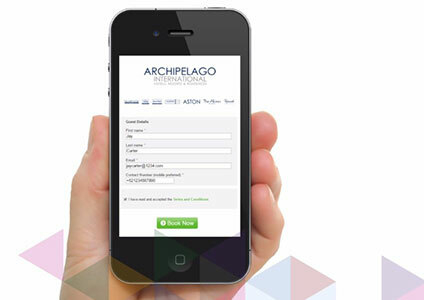 Or, download an Archipelago Membership on GooglePlay and enjoy a faster booking experience.